A dear friend of mine makes this fabulous salsa. I am not sure if it is the incredibly delicious fresh taste of the salsa, the fact that it screams summer or the fact that it reminds me of this friend and her generous soul. Whatever the reason, this salsa is a summer must on your recipe list. Most often served with tortilla chips, this can also accompany grilled meats or even eaten straight from the bowl – as I often do with the goody bag leftovers Sofia always saves for me. Ingredient amounts can vary depending on the taste your like to see most in the salsa. I love the mango flavor coupled with cilantro. With no added fat, this salsa is packed with antioxidants, fiber and vitamins. 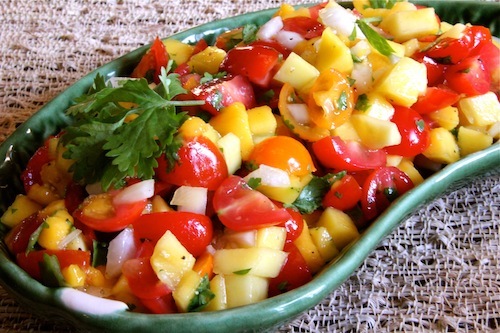 A great fruit salsa to serve with chips or alongside grilled meat or poultry. Serve With: Whole grain tortilla chips or grilled meats. Combine all ingredients through cilantro in a bowl, and toss to mix. Zest and juice the lime and lemon, add the zest and add the juice – a tablespoon of each to start and add more if desired. Add freshly ground pepper and freshly ground sea salt and toss to coat.